The government shutdown has left some craft breweries at a standstill. KANSAS CITY, Mo. 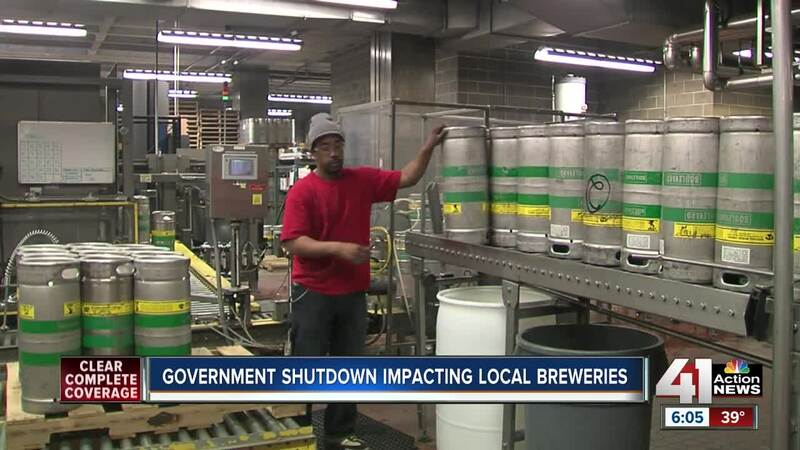 — The government shutdown that's brewing in Washington, D.C., has put local breweries, including Boulevard Brewing Company and the KC Bier Company, in a bind. The federal Alcohol and Tobacco Tax and Trade Bureau (TTB) is in charge of approving labels and license for any new beer, wine and spirits. The agency has been impacted by the shutdown, and some breweries are now waiting for their new products to be approved. "The beers have been named, we have figured out what we're serving, we have submitted those approvals, we're waiting to get kicked back to us with that approval and that hasn't quite happened yet with the shutdown," Andrew Zender, marketing manager at the KC Bier Company, told 41 Action News Thursday. Zender said that approvals by the agency can take anywhere from seven to 10 days to as long as 30 days, depending on the volume of labels. "When there are 6,000 breweries in the U.S., they're dealing with a lot of packaging, a lot of labels that they have to approve," Zender said. But right now, those visiting the agency's website will find a notice telling companies they can submit their application but that it won't be reviewed until the shutdown is over. Boulevard Brewing Company plans to unveil several new beers in 2019, but over a dozen of those still have pending labels. "We feel good about going into the year, but we would hate for some of the new beers we have planned to be at risk if this does not resolve itself quickly," Boulevard Vice President of Marketing Natalie Gershon said. These local breweries are now waiting to see what lawmakers do next. "We're just in a holding pattern," Zender said. "We just have to keep brewing the beer that we're already doing and getting that out there as we wait for approval for the new product." Gershon said that depending on how long the shutdown lasts, it could impact the summer releases that beer companies nationwide have planned.